The United Nations have proclaimed 2019 to be the International Year of the Periodic Table of Chemical Elements since it is the 150th anniversary of the publication of Dmitri Mendeleev's first Periodic Table. But was it really the first? 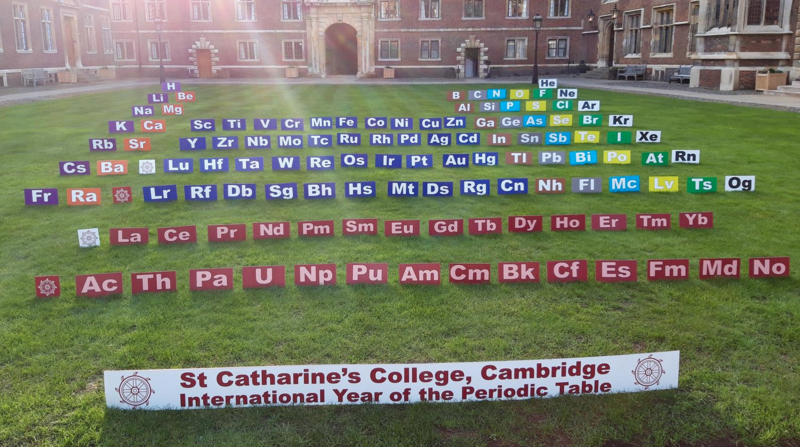 St Catharine's College, Cambridge, in the UK, is proud to exhibit its fine collection of material relating to the early development of the Periodic Table. Starting from the first list of elements which emerged around the time of the French Revolution in the late 1780s, and the first list of atomic masses drawn up by Manchester chemist John Dalton, we explore why six different chemists from around the world each came up with their own versions of the iconic table in the 1860s. "Curated by periodic table superfan Peter Wothers, the main body of the exhibition is a staggering collection of historic books that trace the creation of chemistry's roadmap. "This is an unprecedented record of the periodic table's origins, from early alchemical texts through to original copies of Antoine Lavoisier's 1789 Elementary Treatise of Chemistry – the first true list of elements – and notes on the discoveries of (among others) John Newlands, Julius Lothar Meyer through to Dmitri Mendeleev". Celebrating the periodic table – the first edition of Mendeleev's textbook from Chemistry World on Vimeo.